It's generally accepted as good practise to keep mixing and mastering as two separate stages in production process. If you know what you're doing, though, there's no practical reason why you shouldn't run your mastering chain on the two-bus while mixing, even if only for previewing purposes. Here's a five-step plan for making it work. For more on mastering in your DAW, pick up the May 2018 edition of Future Music. Step 1: We wouldn’t recommend this for beginners, but if you have a decent understanding of mixing, try working into a master processing chain from the start. First, we’ll load an SSL-style bus compressor on our DAW’s master output, in an empty project. Step 2: To begin, we set the compressor up with a gentle 2:1 ratio, 10ms attack and 0.6s release - this will allow transients through, and gently ride the sustain. We set the sidechain filter to 80Hz, to remove heavy sub bass from the compressor’s detection circuit. Step 3: Now it’s time to begin our mix, so we load the individual tracks into our DAW. As we set up a basic level balance, we aim for about 2-3dB of gain reduction on the master bus compressor. This master compressor is guiding our decision-making straight away - adjust compressor settings if needed. Step 4: Our mix is sounding pretty good already, but if we deactivate the master compressor, everything falls apart, as it’s shaped our level-balancing. Moving on, we’d like a bit of analogue colour, so we apply very subtle master bus tape saturation, pre-compression. 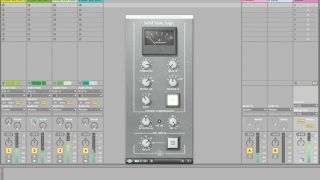 Step 5: To finish, we load a limiter plugin last in the chain. After applying as much gain reduction as possible before distortion or pumping, we then back this off a fraction to retain some dynamics. This master chain is definitely shaping the mix - the track sounds far less gelled and ‘pro’ when we bypass the master plugins.